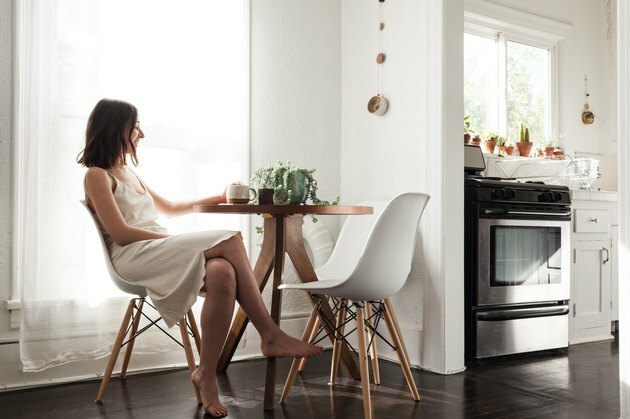 L.A.-based photographer Katherine Rose doesn't mind small space living. In fact, she prefers it. 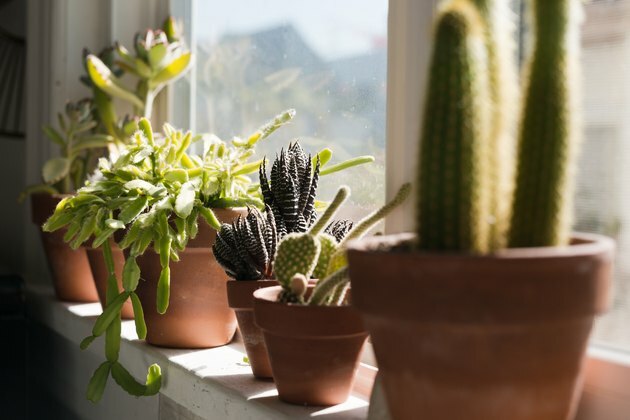 "Having a smaller space was actually quite intentional for me," she says. 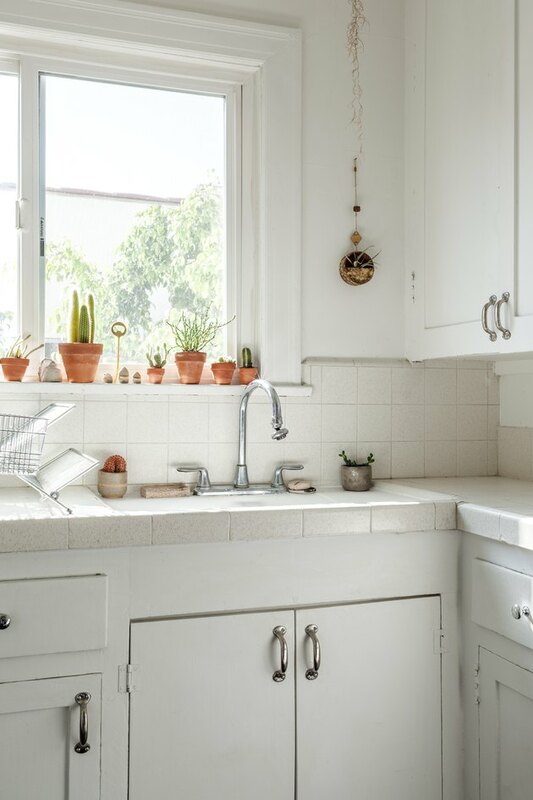 Which is why, when hunting for a place to live, she passed over a four-room apartment for her current home, a quaint 1920s-era studio in Los Feliz. "I wanted to remain as much of a minimalist as possible," the New Jersey native explains, which, truth be told, is a lot easier said than done. (For most, Marie Kondo-ing your life can only last for so long.) 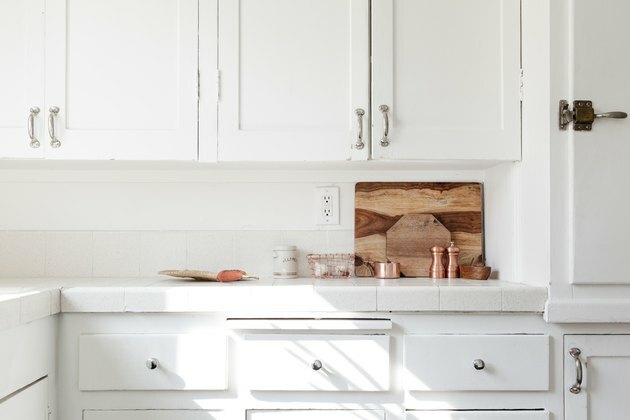 But Katherine is conscious about living with less, and is highly intentional about what she brings into her home: "If I want to purchase something new, that means I need to either donate or sell something I currently have. The same goes for clothes since I have such a small closet." Katherine's studio consists of a single main room, yet each spot has a different purpose. A workstation acts as a home office, while a small round table and chairs becomes a dining nook. 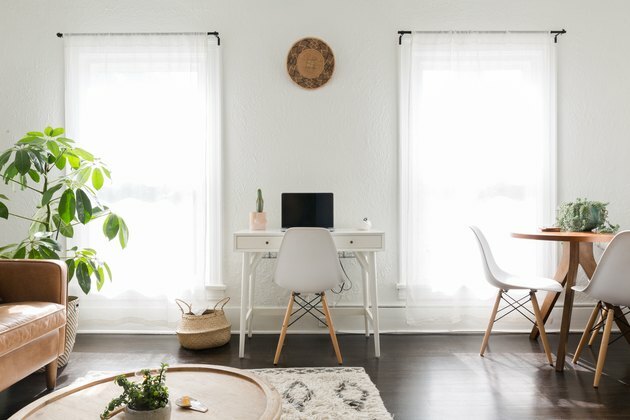 She describes her place as bohemian-meets-minimalist: "Because the space is small, I wanted to make sure it never felt cluttered, but I wanted it to feel warm, inviting, and interesting. I stuck with a really earthy color palette and added a ton of plants and lots of feminist art." A rattan screen is a clever way to create divisions within a small space. As for the decor, many of the larger pieces — like the couch, coffee table, and desk — are from West Elm. 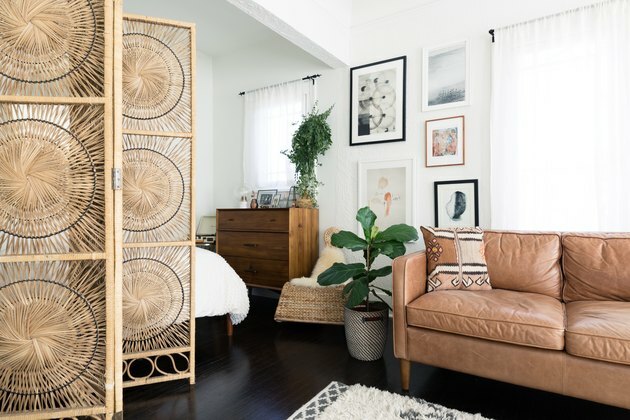 Katherine filled in the rest with accessories from independent L.A. boutiques like Individual Medley or Midland and wall art by German artist Michael Lentz, sourced from Saatchi Art. Thanks to original, French-style windows, the studio is flooded with light. 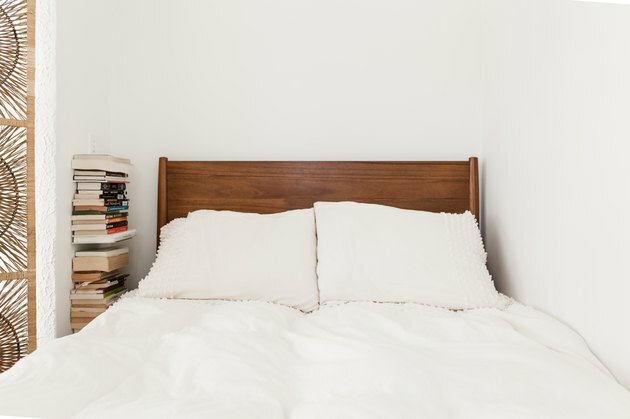 Textured bed linens from Urban Outfitters help emphasize Katherine's bohemian-minimalist aesthetic. Katherine's neighborhood is a huge draw: "Los Feliz is such a great neighborhood. I am walking distance to tons of restaurants, bars, coffee shops, and a movie theater and about a 20 minute walk to Silver Lake. My absolute favorite part of this neighborhood, though, is being so close to Griffith Park — it's my little green haven in this busy city and I love to hike." One way to make a small space feel more open? Making sure surfaces are cleared of clutter, and being selective about what needs to be on display. One of the coolest things about Katherine's apartment is the built-in ice box in the kitchen, a relic from the 1920s. 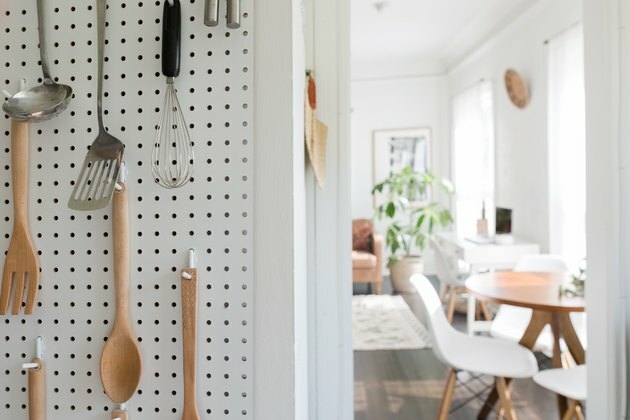 A pegboard provides extra storage. "My home reflects so many of the things I love and value — travel, nature, books — and it's filled with beautiful art pieces that inspire me and remind me of my own strength and power."